It’s becoming more common for home buyers to pay a seller’s full asking price or even make an offer over what the seller is asking. In fact, during the month of June, 55% of the homes sold in Fresno and Clovis went for the listed price or more. “Multiple offers” is a term familiar to many local home buyers. With a low inventory of homes for sale and people wanting to take advantage of record low interest rates, many are competing to buy the same property. In many instances the solution is for buyers to make an offer over the asking price. The median amount buyers paid over the asking price was 3.1% and some people paid as much as 50% more. After several years of a declining market it is finally clear that we have past the bottom and are on the way back up. The major factor causing the market turn-around is the lack of homes available for sale. In May, the National Association of Realtors® recognized the Fresno market as being #2 nationally in the decline of for-sale inventory. And in June the median sales price was up 10% from last June, to $154,000. With so many fewer homes for sale, it’s an excellent time to sell. In 2007 Congress enacted the Mortgage Debt Forgiveness Act (MDFA). The MDFA allows some homeowners whose mortgage debt is partly or entirely forgiven, such as with a short sale, to claim a special tax relief and exclude the debt forgiven from their income. Many people are unaware that the MDFA is set to expire on December 31, 2012. While there is political pressure to get the Act extended, if someone wanted to short sale their home before the end of the year they would need to act IMMEDIATELY. The process of marketing a home, receiving an acceptable offer, obtaining lender short sale approval, and closing escrow can sometimes take 4 to 6 months, or possibly even longer. 1. Normally, debt forgiveness results in taxable income. However under the Mortgage Forgiveness Debt Relief Act, couples may be able to exclude up to $2 million of debt forgiven on their principal residence. 2. They may exclude debt reduced through mortgage restructuring, as well as mortgage debt forgiven in a foreclosure. 3. To qualify, the debt must have been used to buy, build, or substantially improve their principal residence and be secured by that residence. 4. Refinanced debt proceeds used for the purpose of substantially improving their principal residence also qualify for the exclusion. 5. Proceeds of refinanced debt used for other purposes – for example, to pay off credit card debt- do not qualify for the exclusion. 6. Debt forgiven on second homes, rental property, business property, credit cards, or car loans does not qualify for the tax relief provision. Anyone interested in determining if they qualify for the MDFA should consult their tax professional. Information is also available on-line from the IRS at irs.gov. A good resource is IRS Publication 4681, Canceled Debts, Foreclosures, Repossessions and Abandonments. Borrowers can also use the Interactive Tax Assistant to determine if the cancellation of debt is taxable. The ITA tool is a resource that steps people through a series of questions and provides them with responses to tax law questions. Joan Eaton, owner/broker of Guarantee Real Estate, made a presentation at the Economic Development Corporation’s Real Estate Forecast in March 2012. Speaking specifically about residential real estate, this insightful video contains the statistical reasons and other factors that have influenced Eaton’s rather bullish outlook on real estate in the Central San Joaquin Valley. What is the ideal time to sell a home and move up to a larger one or a more desirable neighborhood? Experienced Realtors® would answer that question with, “When there are more people buying in your home’s price range than there are homes available for sale. When interest rates are low. And when there is a large supply of homes in the price range in which you want to buy.” BINGO, that perfectly describes today’s market in the Central Valley. Over the past 5 years the Central Valley has had its share of struggles in the housing market. Foreclosure and short sale properties have been a majority of the sales. Many homeowners with a desire or need to move up have put their plans on hold, sometimes because they didn’t want to be in a pricing war against a bank-owned property. The media’s repeated headlines about “distressed sale properties,” seems to ignore the fact that 45% of the homes sold in Fresno County in the last 3 months have been what real estate agents have labeled “traditional sellers,” people who have equity in their home. We’ve been looking at the glass as half empty instead of half full. There’s a lot of good news for those traditional sellers who are considering a move up. First being that the median sales price in Fresno County has leveled off. The Median Sales Price Graph reflects that home values in Fresno County have hovered around $138,000 for the first seven months of 2011. Another reason move-up buyers should consider this a good time to move is the under supply of homes in lower price ranges. A Month’s Supply of Inventory” (MSI) is a gauge for determining price appreciation. If there is less than 3 month’s supply of inventory, it should be easier to sell properties. With a limited supply, buyers may also be willing to offer more for a property to increase the chance their offer will be accepted. An inventory of 3 to 6 months is considered an acceptable supply that should keep values stable and selling times reasonable. An inventory of more than 6 months is considered an oversupply and home sellers may need to reduce their asking price in order to get their home sold. The Month’s Supply of Inventory Graph shows that there is a limited supply of homes priced under $250,000, and a stable supply of homes priced between $250,000 and $400,000. And more good news for move-up buyers, there is an abundance of homes to choose from in upper price ranges over $400,000. There will no doubt be a continued supply of homes coming on the market that are in the process of foreclosure or already owned by banks. However the inventory supply at this time is ideal for people to sell homes in lower price ranges. Many buyers prefer purchasing homes from traditional sellers for several reasons. Often times the homes have been better maintained. Property owners also have knowledge of the condition of the property and are able to provide buyers with disclosures. While home sellers have the right to determine if they will make repairs, many banks have a “no repairs, as-is” policy. And finally, the time frame for getting offers accepted can be greatly shortened when dealing with a traditional seller vs. a bank involved with a short sale or REO listing. Move-up buyers can also take advantage of the lowest interest rates in 40 years. These rates will allow buyers in today’s market to be able to afford “more house” than if they wait and encounter higher rates in the future. Guarantee Real Estate agents can provide home sellers with an estimated value for their home and help them identify if now would be a good time for them to make a move. 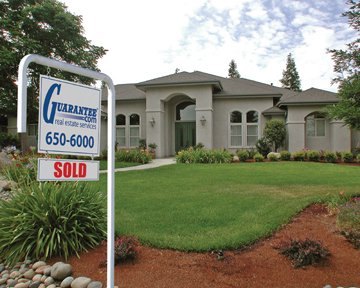 Home buyers can access guarantee.com for details on every home for sale in Fresno, Madera, Tulare, and Kings Counties. We all know that residential real estate markets are local. Don’t we? While at our Fig Garden Village Office yesterday, one of our Sales Associates told me that she was working with buyers in the $250,000 to $300,000 range and every time they made an offer on a property, they found themselves in a multiple offer situation. “More buyers than sellers” flatly contradicts yesterday’s news that home prices are declining. Mr. Case and Mr. Schiller are brilliant economists and arguably their Case Schiller Index for U.S. Home Prices is THE index . . . . except Fresno, our local market, is not part of the Case Schiller Index as recently reported in the national news, and (much worse) reported in the Fresno Bee, and on our local Fresno TV stations. Many major markets are still undergoing price adjustments, but not Fresno. What does a buyer in Fresno need to know? Well, first of all, there are many other factors for a buyer to consider before they dive into the market statistics. Picking the precise “bottom” of the market is impossible, but understanding basic trends is not. Here’s a trend that I think every Fresno buyer should know. The median price for a single family home in Fresno &amp; Clovis in April 2009 was $143,000, in April 2010 it was $155,000, and in 2011 it was $145,000. Did it go up, and then down? Yes, BUT likely because during the spring of 2010 it was artificially propped up by the $10,000 State and $8,000 Federal Home Buyer’s Tax Credits. These tax credits stimulated activity. As the deadline drew near, people were willing to pay a higher price for a limited inventory and thereby not miss out on a once in a life time tax refund opportunity. So is the Fresno market really down 7% (from $155,000 in 2010 to $145,000 in 2011)? Or is it up 1% (from $143,000 in 2009 to $145,000 in 2011)? Both statistics are mathematically correct! I don’t think the Fresno market has declined or is taking a double dip, I do think it is still recovering and values should remain relatively neutral. The outlook is positive over the next several years. I believe that it is a great time to buy for the homeowner with a long term perspective. Home values are at, or in some cases below, replacement costs. Interest rates are at historic lows. Don’t get caught trying to pick the “bottom of the market”. Pick a home that you would love to live in; one that you will appreciate. In this C.A.R. analysis, buyers in Fresno County would need an income of $18,040 and a 10% down payment in order to purchase an entry level home valued at $117,500. Prices have stabilized over the past 2 years in the Fresno area after hitting bottom in February 2009. This news surprises most buyers as National news channels tout that home prices continue to fall. However, real estate prices are a local economy. Fresno was one of the first markets to go into the real estate recession beginning back in 2007 and Fresno is one of the first markets to come out of that recession. Buying a home in Fresno instead of renting does not have to be perceived as too expensive. Jeff Merrill of Guarantee Home Loans stated that a purchase on an $150,000 home with an FHA loan will have a total payment of approximately $1075.00 per month. Of that, approximately $200 is going towards the principal balance each month and another $200 could potentially be saved in the homeowner’s taxes (*) under mortgage interest deduction. That would bring the real cost of the $150,000 home to as little as $675 per month. Compare that to renting – where the entire payment is not going towards any principal balance, or income tax reduction. It may be time to consider how much you can afford. Check out Guarantee Home Loans’ 60 Second application and their Loan Officers can give you a good estimate of your buying power. (*)Guarantee Real Estate &amp; Guarantee Home Loans are not tax accountants and recommend that individuals contact their tax consultants to determine the homeownership tax benefits for their specific financial situation.